The great thing about making a wreath is that you can make it as large or as small as you like. Just remember to have plenty of Jelly Belly jelly beans on hand! Tint ½ cup of the vanilla frosting red with the food coloring and spoon frosting into a small re-sealable bag; set aside. Tint the remaining 1 cup of vanilla frosting green with the food coloring. Spread the tops of the cupcakes with the green frosting. Arrange a line of Green Apple Jelly Belly jelly beans, end to end across the top of all but 1 cupcake. Arrange the Kiwi and Margarita Jelly Belly jelly beans on either side of the Green Apple Jelly Belly jelly beans to create the holly leaf shape. Allow the beans to stand up slightly to give some texture or motion. 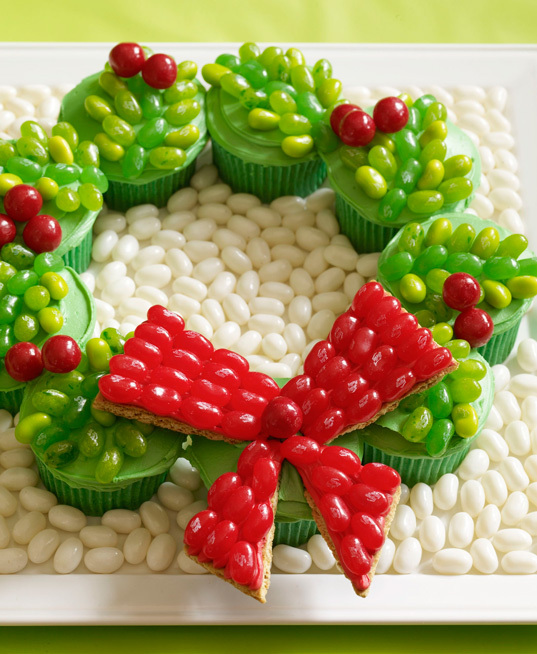 Place the cupcakes in a circle on a serving platter, keeping the plain cupcake at the bottom of wreath. Using a serrated knife cut the graham crackers into two 2 by 1 ½ inch triangles and two 2 ½ by 3 inch triangles. Snip a small corner from the bag with the red frosting. Pipe the red frosting on top of the graham cracker pieces. Arrange the Very Cherry Jelly Belly jelly beans in rows on top of the graham cracker pieces. Place the pieces on top of the plain frosted cupcake using the pretzel sticks as support under the crackers to make the bow. Place the cherry sour balls in clusters on top of the wreath and one in the center of the bow. Spread the Coconut Jelly Belly jelly beans all over the platter around the wreath.